Despite grumblings about the supposedly long lost Madison music scene, new and talented bands keep rising up as if nothing had ever burned or closed down. The better ones, like anywhere else, are those that seem to defy easy categorization. You hear a hint of this and a reference to that, but you can’t pin the group down. Such is the case with Lorenzo Music. At the core are two musicians who have experienced the changing musical tides here between the lakes. Tod Schwenn spent a good amount of time in Rapscallion during the late-80s and early-90s, around the same time Tom Ray was in Fallacy. After those bands broke up, the two decided to start jamming and writing together. The songs came together so well that they decided to form a permanent band and, after finding the right musicians, did their first gig in March of 1996. Lorenzo Music explores many areas of sound, going from keyboard- driven, Doors-like jams to lounge swings to power guitars in a single song. The key is that they do it gracefully, at times almost unnoticeably. Most of the keyboards are done on a vintage Rhodes electric piano that Ray bought for $150 when such instruments were out of style. Schwenn supplies the guitar and the two share the vocal work. Every musician in this band has experience: second guitarist Brandon Krueger was in Peep Show, bassist Mark Whitcomb played in Insanity A.D., Carl and Swiggo, and drummer Scott Beardsley also gigged with Swiggo as well as Mindox (which also featured Buddo of Magic 7 & Last Crack). The ace in the hole for this band, however, is the horn section, which lends a big band feel to an already diverse sound. Big brass is something Ray has always liked. He’s played trumpet since childhood and doubles on that instrument in the group. Jeff Berry plays the tenor saxophone and Lucius Corr rounds out the section with baritone sax. Playing in Dane County isn’t quite as easy as it once was, according to Ray. The biggest problem is the lack of clubs dedicated to live music. The key, he says, is to be resourceful when it comes to venues. Sometimes, a tavern or bar owner can be talked into trying out live music or making a special occasion for a show. Bands need to rely on one another as well, piggy-backing on each other to find and develop shows. 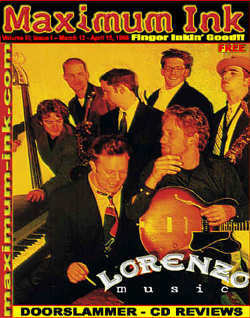 Lorenzo Music plays many of the part-time live rock clubs in town, including the Inferno, a club known for its dark, gothic feel. But the band isn’t really part of the goth scene. The club’s owner really likes the sound of the band and wants diverse acts. For the group, it’s simply a good place to play. On a recent “Lounge Night” at the Inferno, Lorenzo Music warmed up for Vic & The Volare Lounge Orchestra. They played to a near-capacity crowd that seemed equally enthusiastic about both bands. Many came in suits or formal dresses, dancing the night away as if the swing era had suddenly risen again. People I spoke with talked of the occasion as if it were the beginning of a whole new movement in the Midwest, a sort of post-modern swing thing. Regardless of whether or not it develops into an ongoing “scene,” there is no doubt that Lorenzo Music is at the center of this big band/rock hybrid in Madison. The world can look for the first album from this eccentric group sometime early this summer. At the moment, they are in the studio laying down the basic tracks. Although the band declined to say exactly what label might be involved, the disc will be available at your local record store and at live shows. In the meantime, if you’re looking for talented musicians playing music that is anything but ordinary, get to a Lorenzo Music gig.